Today, the Riigikogu concluded the first reading of the Bill changing the financing of schools. According to the Bill, the funds designated for education expenditure support investments will be directed at teachers' salary growth. The Bill on Amendments to the Basic Schools and Upper Secondary Schools Act and the Private Schools Act (140 SE), initiated by the Government, will change the structure of the education expenditure support allocated to local governments and private general education schools. According to the Bill, increase of teachers’ pay will be set as a priority of the education support from the state. The funds designated for education expenditure support investments, amounting to nearly 2.6 million euro, will be directed at teachers’ salary growth. As a result, the teachers’ labour costs support allocated from the state budget can be raised to 1.4 per cent. Analogously to municipal schools, the support for covering investment-related costs will be excluded from the education support allocated to private schools from the state budget. In other aspects, the principles of the financing of private schools will not be changed with the Bill, and education support will be allocated from the state budget to private schools on the same bases with municipal schools. Lauri Luik, Mailis Reps, Martin Helme and Krista Aru took the floor during the debate. The Cultural Affairs Committee as the lead committee moved to reject the Bill. 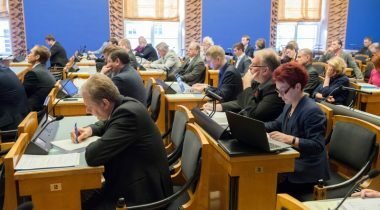 36 members of the Riigikogu were in favour of the motion, 50 were against, and there was one abstention. The motion was not supported. The Riigikogu concluded the second reading of the Bill on Amendments to the Citizen of the European Union Act and Amendments to Other Associated Acts (57 SE), initiated by the Government. The Bill will bring the Act into conformity with the requirements of the relevant EU directive on the right of citizens of the Union and their family members to move and reside freely within the territory of the Member States. The amendments concern the legal bases for restricting the stay of EU citizens and their family members in Estonia, and the punishments imposed for working here without a legal basis. Also, new elements of a misdemeanour will be provided, concerning the stay of EU citizens and their family members in Estonia during prohibition on entry. The conditions for the imposition of punishments for taking aliens illegally across the border and for the facilitation of illegal stay in Estonia are also specified. Jüri Adams, Martin Helme and Mart Helme took the floor during the debate. The Conservative People’s Party Faction moved to suspend the second reading of the Bill. 17 members of the Riigikogu were in favour of the motion, 51 were against, and there were 3 abstentions. The motion was not supported. The first reading of the draft Resolution of the Riigikogu “Formation of the Riigikogu Study Committee for Analysing Estonian Drug Policy and HIV Prevention, and for Enhancing Prevention” (122 OE), initiated by 57 members of the Riigikogu, was adjourned in the Riigikogu. The reading of the draft Resolution will be resumed at tomorrow’s sitting. The Bill on Amendments to the Labour Market Services and Benefits Act (92 SE), initiated by the Estonian Free Party Faction, the Bill on Amendments to the Restrictions on Acquisition of Immovables Act (96 SE), initiated by the Estonian Centre Party Faction, and the Registered Partnership Act Implementation Bill (114 SE), initiated by 38 members of the Riigikogu, were also on the agenda of today’s sitting, but there was no time for them and the Bills were transferred to the agenda for tomorrow’s sitting.